Servo Drives come in two varieties; analog and digital. Analog amplifiers or drives have little to no processing capability and perform all the drive functionality strictly in the analog domain. Due to the additional intelligence available on digital drives, they have more functionality, diagnosis capabilities, and easier configuration compared to analog drives. Intelligent Drives/Smart Drives are digital drives that combine a portion, or all, of the motion controller functionality with the high power electronics of a motor drive. Smart drives vary with the amount of control functionality and type of communication interface. There are generally two types: fieldbus based and deterministic bus based. Fieldbus based intelligent drives contain all the components of a motion controller and are communicated to via a serial port or a fieldbus network. 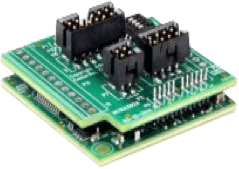 They are typically used for non-coordinated motion control applications. Servo2Go® offers a variety of network options for connecting servo drives in a multi-axis configuration. Choosing the right network depends on a variety of factors such as required bandwidth, update rate, performance, and cost. Currently supported network options are: CANopen, EtherCAT®, RS232, RS485, DeviceNet, Profibus, Ethernet/IP, PROFINET, Modbus TCP/IP and SynqNet. Deterministic bus based intelligent drives typically incorporate the interpolation and control loop into the drive but rely on a motion controller to perform the trajectory generation. The benefits of either intelligent drive topology include all digital communication, detailed diagnostics, reduced cabling, high axes count and short wiring distance between the drive and motor.